There are days when I wake up and say, "John Lennon was right." Maybe we really would be better off in a world without nationalism or religion. So much blood has been shed throughout history in the name of these beliefs, especially in my part of the world, the Middle East. Here in Israel, we have a thriving if imperfect democracy plagued, as are most democracies, by racism and discrimination. There is democracy in Israel proper, including for those Palestinians who are Israeli citizens. There is no democracy for Palestinians in the Occupied Territories, however. Israelis are deeply divided on many key issues. Many support the positions of the organization I have led for more than 18 years, Rabbis For Human Rights, but ironically most supporting us on the human rights of non-Jews are secular. On issues of socioeconomic rights within Jewish-Israeli society, however, many religious Jews believe, as do we, that it is a Jewish obligation to build a society that cares for its weakest and poorest members. Painfully for me as a rabbi, however, polls consistently show that religious Jews in Israel are more likely to be racist, xenophobic and opposed to human rights for non-Jews. They are the ideological vanguard behind the settlement movement, believing that the religious obligation to settle the Biblical Land of Israel overrides our religious obligation not to oppress non-Jews. For some, the obligation not to oppress non-Jews is nonexistent. So why not just acknowledge reality and work for a world without nations or religion, where we all speak Esperanto? Here’s why: Were we to eliminate all the divisions between us tomorrow, we would likely create new ones the very next day. Faith, moreover, is not something one simply turns on and off like a light. And finally, given religion’s tremendous power, it would be a terrible mistake to abandon the field to those who interpret it in xenophobic ways. Several years ago, I attended a conference co-sponsored by the Norwegian Foreign Ministry and an Oslo peace organization. The premise was that, while civil society and diplomats had for years thought that they must circumvent religion to solve conflicts, the diplomatic community had come to realize this wasn't possible, and that religion must become part of the solution. At Rabbis for Human Rights, our first mandate is to prevent or redress human rights abuses. Our second is to introduce to our fellow Jewish-Israelis another way of understanding Judaism, an interpretation very different from that which currently dominates. The dominant understanding is very different from the Judaism I grew up with. In Erie, Pennsylvania, it was simply assumed that a basic part of what it means to be a Jew was to be committed to universal human rights and social justice. This is what I learned from my parents, from my rabbis, from my community. Polls consistently show that a commitment to justice is a key component of North American Jewish identity. For many years, almost all of Rabbis for Human Rights’ financial and moral support came from Jews in the United States and Canada, particularly from our fellow rabbis. I was truly shocked when I discovered that values axiomatic to me were not shared by all Israeli Jews, especially religious Jews. Increasingly, religious Jews, particularly members of what is called the "national religious camp," are socialized into a very problematic mixture of extreme nationalism and Jewish particularism. Particularism means that the ultimate value is the survival and wellbeing of the Jewish people. It means that all of the wonderful humanist values and Jewish commandments flowing from the teaching in Genesis 1:27 – that humans are created in God's Image – apply only to our treatment of Jews. Some would not even apply them to all Jews, but only to their own insular community. At Rabbis for Human Rights, however, we note that Genesis doesn't say that only Jews, or only the wealthy, were created in God's Image. The Torah specifically states that both men and women – all men and women – were created in God's Image. American and Canadian Jews who are liberal on just about any other human rights issue are often defensive when it comes to Israel. Unwillingness to confront Israel's treatment of Palestinians is not just a function of religious belief but also of our collective consciousness. This consciousness stems from 2000 years of oppression, along with the ongoing enmity toward Israel in our region and beyond. I penned these words shortly before our Jewish holiday of Purim, when we read the Book of Esther, a story about the precariousness of Jewish life when our fate is in the hands of others. In April, the traditional Passover Seder contains the words, "In every generation there are those who have risen up to destroy us." These lessons give rise to the strong feeling that Jews must circle their wagons to protect themselves against the non-Jewish world. Many Jews who have concerns about human rights issues in Israel keep their thoughts to themselves out of fear that their words will be twisted by those who wish to delegitimize Israel's very existence. They can see those who violate this taboo as traitors. We see this same tendency in many groups with a history of oppression. Many Jewish Israelis aspire to be moral and just. Most truly believe that the human rights abuses we talk about are isolated, non-representative incidents that the government is doing everything it can to combat and that we have the most moral army in the world. It is frustrating that they live in a bubble, but it is positive that they aspire to having the most moral army in the world. At Rabbis for Human Rights, our task is to find a way of holding up a mirror to our fellow Jewish Israelis, and to tell them, "We know that you aspire to be good and decent people, but take a look at what we are actually doing. Is this who we want to be?" Easier said than done, of course. To tell Jewish Israelis that we don't have the most moral army in the world, or that our human rights abuses are often intentional and systematic, is to burst one of their most cherished bubbles. People get angry and resistant when their bubbles are burst. In 2002 Palestinians attempting to harvest their olives and those of us acting as human shields to protect them were being shot at, beaten, threatened, etc., without the Israeli security forces intervening. As the result of a 2006 Israeli High Court victory, the army is now protecting Palestinian access to places they couldn't previously reach for as many as 15 years. Significant tracts of land have been returned to their Palestinian owners. 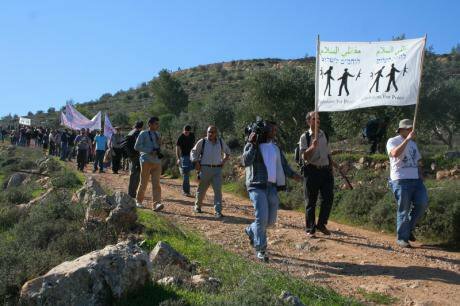 In 2009, Rabbis for Human Rights returned residents to the village of Bir El-Id, abandoned for almost 10 years because of settler intimidation. Rabbis for Human Rights helped end the Israeli Wisconsin Plan, a carrot-and-stick approach to returning the unemployed to the workforce that around the world has almost always increased poverty. We have helped to improve the lives of both our fellow Israeli Jews and of the many non-Jews who are part of our society or under our control. Yet I must also acknowledge that few of our successes are connected to the fact that we are rabbis. On April 6, 2014, we marked our anniversary with a panel discussion on what is, could and should be the role of Judaism in the struggle for human rights in Israel. We are still searching for the answers and looking for new ways to better fulfill our mission. Rabbis for Human Rights was founded in 1988 by a group of Orthodox, Reform and Conservative rabbis led by Rabbi David Forman (may his memory be blessed). In the late 1980s, during the challenging days of the first Palestinian intifada, Rabbi Forman wrote an open letter to Israel's Chief Rabbis, asking why the religious establishment focused almost solely on Sabbath observance and Kashrut, our Jewish dietary laws. As important as these things are, Rabbi Forman said, where were rabbis on the burning moral issues of the day? We should not ignore the very real dangers we faced, Rabbi Forman said, but these threats should not be used as an excuse to behave immorally. In the words of Hillel the Elder, "If I am not for myself, who will be for me? If I am only for myself, what am I? And if not now, when?" Today, Rabbis for Human Rights number approximately 100 rabbis from various liberal and Orthodox streams of Judaism, with some 30 full- and part-time staff members. Many of these are rabbis, but some are secular, Christian or Muslim. The organization defines itself as Zionist. We believe, however, that true Zionism, and our self-interest, lies in working for an Israel that is not just physically but morally strong, one that lives up to our highest Jewish values. These values were part of what we dreamed of when we wrote in our Declaration of Independence that Israel would be based on "Freedom, justice and peace as envisaged by the prophets of Israel," and that it would guarantee "Total social and political equality for all, regardless of race, nationality or gender." A key principle of my Zionism is that I can't ask for myself what I am not prepared to grant to others. This includes the human rights and national aspirations of Palestinians. Rabbis for Human Rights believes that the Occupation must end because it inevitably leads to human rights violations. However, it is beyond our mandate to take a position on a one- or two-state solution, borders, or various possibilities regarding what ending the Occupation might look like. Our organization is involved in protecting the human rights of both Jewish Israelis and of non-Jews who are a part of our society or under our control. We serve as a beacon for all those Jewish Israelis, religious or secular, who believe that their humanistic values are rooted in Judaism. The national Orthodox community does not like us, and often has misconceptions regarding who and what we are. But they are quite aware that we throw a monkey wrench into the symbiotic relationship they have created between Judaism and all those political positions that are antithetical to human rights. Rabbis for Human Rights’ work often causes cognitive dissonance, forcing people to reexamine their stereotypes and beliefs. Ironically, we may have been most effective in breaking down Palestinian stereotypes of religious Jews. Many times I have gone to rebuild a demolished home or defend Palestinian human rights, and find that Palestinian parents insist that their son, who wants to grow up and be a terrorist, meet us in order to understand that not all Israelis come with guns to demolish their homes and trample on their human rights. Combatants for Peace, Rabbis for Human Rights and the Israeli Committee against House demolitions held a nonviolent demonstration alongside the inhabitants of Wallaje in Bethlehem province in January 2010.Richard Stitt/Demotix. All rights reserved. Faith has helped me continue in this work for so many years, when many have burned out. We are taught, "You are not expected to complete the task by yourself, but neither are you free to desist from doing your part.” We each need to play a role in the grand drama that is God's plan. We believe that the eventual outcome will be a world that honors God’s Image, in every human being. As the Middle East and Israeli Jews become increasingly motivated by religious belief, we must struggle for Judaism's soul. We must find a way to introduce our understanding of the Jewish tradition into the intellectual universe of our fellow Jewish Israelis. We must make Judaism part of the solution, and not just part of the problem. The religious text, Pirkei Avot, teaches us, "In a place where no one acts with basic human decency, you must be the person who does." I would add, "In places where rabbis are strikingly absent, you must be the rabbi who acts as rabbis should."